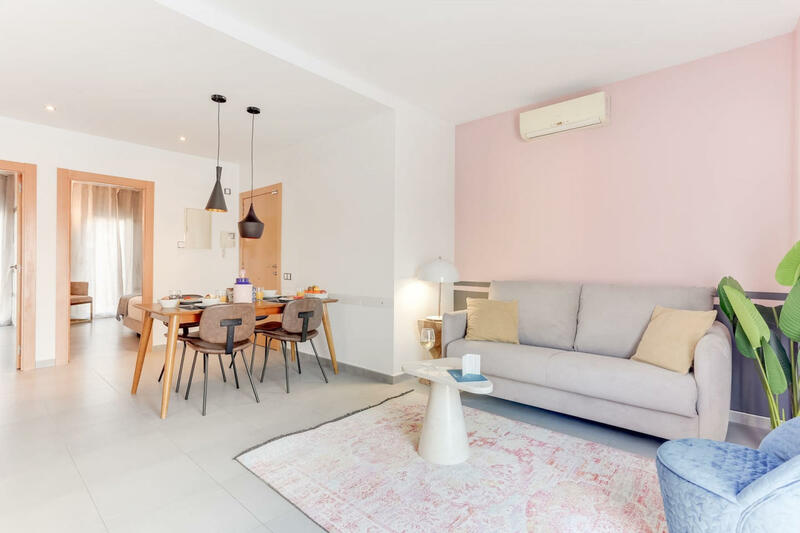 Nestled between two leafy green parks and just around the corner from the famous Plaza Espana, the lovely 2 bedroom Callao V vacation apartment is ideally located on a quiet street close to everything -- great museums, fabulous shopping, fine dining and architectural treasures.On foot you can easily stroll to the Arenas Shopping Center (10 min), the Magic Fountain (15 min) and the Parc de Joan Miro (5 min). Buses run down the street and the Hostafrancs Metro is just down the street (2 min). Inspired by Art Deco, our local interior designers combined classic and contemporary style to create a modern, comfortable space with chic appeal. 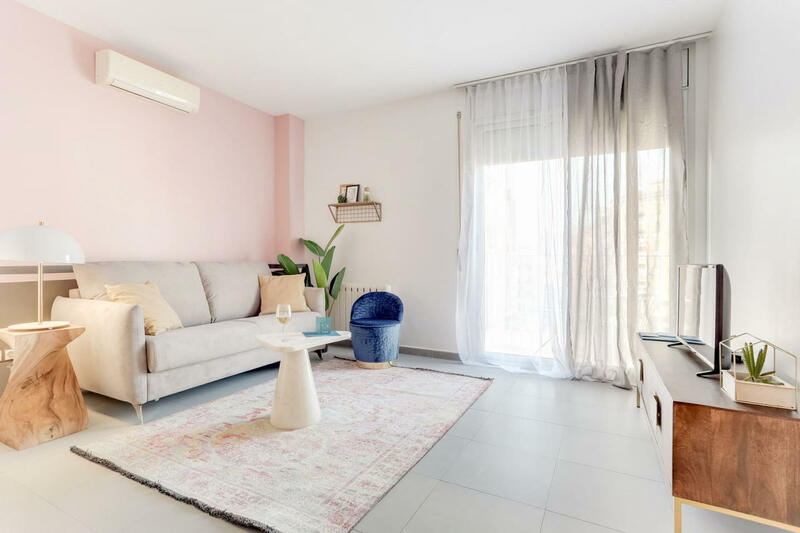 Vintage furnishings, soft gray and pastel color schemes and large floor to ceiling windows make this lovely apartment extra comfortable. Plush bedrooms, decorated with clean lines and generous pillows, will lull you to sleep. The fully equipped kitchen has everything you need to prepare a feast. Premium amenities include free WiFi, cable TV, hotel beds and linens, luxury amenities, and a Nespresso machine. 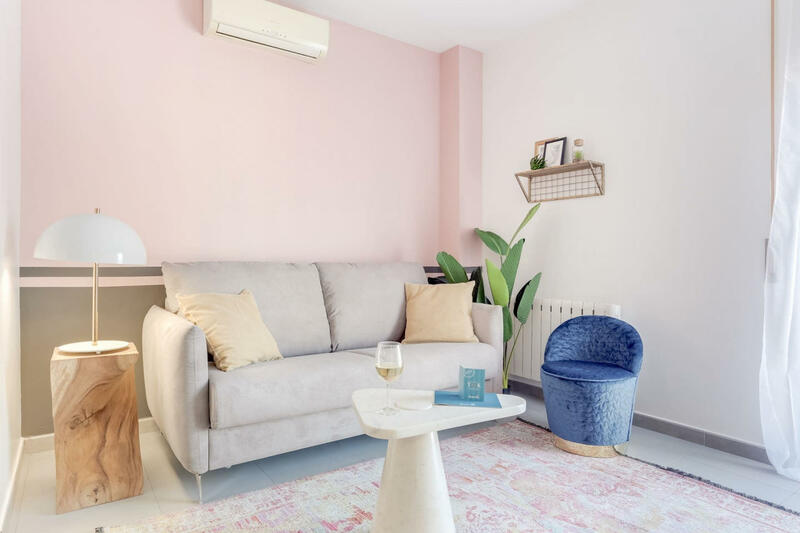 Perfect for couples or small groups, this cosy, light-filled holiday apartment is the ideal location for exploring the best of Barcelona.